Our cake menu changes with the seasons and the ingredients available, here is a list of our favourites. 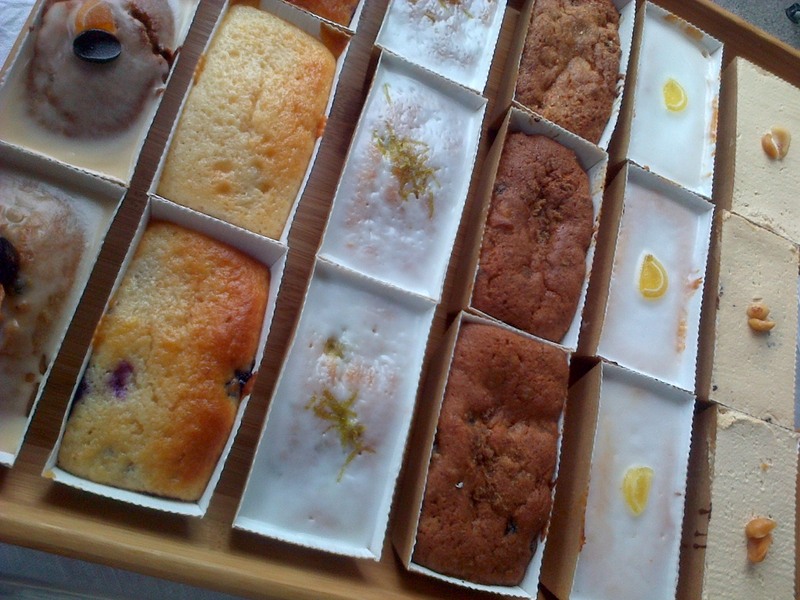 Most of these flavours are available in mini loaves, tray bakes or round cakes for slicing, and many can be used for wedding cakes and celebration cakes too. Morello cherry and marzipan: whole cherries and pieces of marzipan, what could possibly go wrong? * We make our gluten free recipes with gluten free flour and other ingredients that do not contain gluten. ^ Our vegan recipes contain no eggs or dairy ingredients (butter and milk, for example). All of the recipes listed above are suitable for vegetarians. We do sometimes make a rocky road with marshmallows, which contain gelatine. All of the eggs we use are British free range. There are 14 recognised food allergens in total (including things like gluten, milk, eggs, nuts, and peanuts), all of which are present in our kitchen at one time or another. We can provide you with details of which recipes are known to contain which food allergens, please email us if you have any questions about this. We take great care to avoid cross-contamination, however we cannot guarantee any of our recipes are 100% free of any of the 14 recognised food allergens. If you want to know more about food allergens, take a look at the Food Standards Agency website. Our kitchen has been awarded the highest Food Standards Agency food hygiene rating of 5 (very good) by Salford Council, and you can see our food hygiene certificate online.